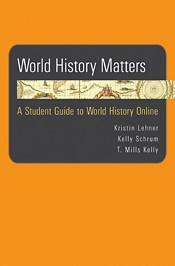 Based on the popular "World History Matters" Web site produced by the Center for History and New Media, this unique resource combines reviews of 150 of the most useful and reliable world history Web sites with an introduction that guides students in locating, evaluating, and correctly citing online sources. Chosen and annotated by a group of Internet-savvy scholars, the Web sites offer opportunities for researching broad themes as well as special topics and regions. They feature a range of sources, including primary documents, maps, art, photographs, statistics, and audio and video recordings. The informative introduction and intelligent apparatus help students make the most of these resources.